The Ann Arbor Board of Education is scheduled to hear the district's evaluation of a proposed balanced calendar concept on April 18. Some parents at Scarlett Middle School may be surprised to learn the balanced calendar idea for the Mitchell-Scarlett Teaching and Learning Collaboration is still being considered, based on recent conversations. 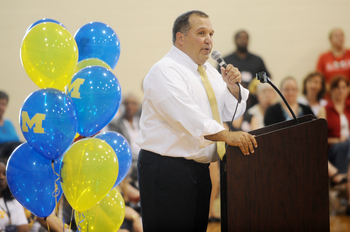 Scarlett Middle School principal Gerald Vazquez speaks during a presentation announcing the Mitchell-Scarlett/U-M School of Education partnership in the Scarlett gym last September. Parents said at last week’s sixth-grade orientation, Principal Gerald Vazquez told incoming families the year-round school proposal is off the table, unless Superintendent Patricia Green decides to implement it district-wide. Members of Scarlett’s parent-teacher-student organization said Vazquez made a similar remark at their recent meeting. we wouldn’t see it next year,” she said. However, district spokeswoman Liz Margolis said a decision on the balanced calendar for Mitchell, Scarlett or district-wide has not been made yet. Although, she would “highly doubt” if any movement toward a balanced calendar district-wide was being considered “at this time,” she said. The district’s instructional team, led by Deputy Superintendent Alesia Flye, will report on the balanced calendar concept to the Board of Education at its April 18 Committee of the Whole meeting. Administrators declined to comment on whether the balanced calendar is being evaluated for 2012-13 or a later date. Margolis said this information would be part of the upcoming report. “We don't want to get out ahead of ourselves before the administration report is complete and presented to the board,” she said. Green said she would make a recommendation after she reviewed the report the instructional team is developing. The balanced calendar was an original, intended component of the school district’s partnership with the University of Michigan for the Mitchell-Scarlett TLC. The year-round school concept for Mitchell, Scarlett and its feeder elementary schools was postponed after attracting criticism from the community, so the Mitchell-Scarlett TLC was launched in September without the calendar. Fri, Mar 16, 2012 : 7:41 p.m. I am definitely for year round school. During the summer, kids forget a large percentage of what they learned in schools, and this is partly why we are lagging behind schools in China and other places that have year round school. Shorter vacations might increase retention rates. Schools that are not being used in the summer are inefficient. Short breaks can provide time for students to receive enrichment education. Remediation can occur when it is most needed during the school year. Students get bored during the long break of summer. It's easier to schedule vacations because not everyone wants to travel at the same time. Other countries around the world use this system. More students can be accommodated at one school through multi-tracking. The reason for placing the balanced calendar at Scarlett-Mitchell is because it is a) supposed to help the most with low-income kids who tend to lose the most knowledge over the summer because they don't get the supplemental activities that middle and upper-income kids get over the summer (camps, trips out of town, music lessons. . . ) The other rationale is that they would offer &quot;supportive activities&quot; during the various breaks, and those &quot;supportive activities&quot; would be paid for by Title 1 funds. Title 1 funds are only available for schools with large numbers of low-income kids--they are distributed based on free and reduced price lunch enrollment. I agree that there needs to be an &quot;opt-out&quot; option for families. For that matter, there should be an &quot;opt-in&quot; option as well. IF they implement it at all. And frankly, it seems to me that when there are so many other pressing issues for the district, this should be a non-starter. Tue, Mar 13, 2012 : 10:30 p.m.
Tue, Mar 13, 2012 : 5:28 p.m. The balanced calender would be a logistical nightmare for the district to pull off. So many elementary schools feed into Scarlett and then from there to the high school, what a mess. If you want a balanced calender it would need to be ALL AAPS schools, which I just don't see happening. Go back to starting before Labor Day (means changing a law in Lansing) and then look at the calender. I think it would work out to 10 weeks off in the summer. Lets all be honest, this wasn't an AAPS issue until the UofM threw out the idea. And because the UofM was suppose to help pull it off, it became a talking point. This is a gigantic decision, you had better make sure you have parent input, or life will truly be miserable for the folks working at these schools. Tue, Mar 13, 2012 : 6:02 p.m.
And for the parents of students at these schools!! I agree that this seems to have been driven by the UM, and I am not at all happy about my kids being guinea pigs for them. Tue, Mar 13, 2012 : 5:22 p.m. I like the idea of year-round school (research does show some positive gains), of course we need to really explore how this will effectively work. I also think one way to &quot;Fix&quot; the problem at Scarlett-Mitchell is to make Scarlett-Mitchell the Ann Arbor Open School. I think it would draw more minorities/diversity into Open (they currently have the lowest minority population in the district). The Mack building could become another middle school. I would love to see this new version of Open be a year-round pilot for the district. Tue, Mar 13, 2012 : 6:04 p.m. I completely agree that Mitchell-Scarlett should become a magnet school like AA Open. That school has a distinct focus already and a huge wait list - rather than messing with that successful program, Mitchell-Scarlett could become a 2nd K-8 school of choice with a different focus. If part of its focus included a balanced calendar, that would be fine, as long as the only families there are those that CHOOSE to attend. Tue, Mar 13, 2012 : 4:26 p.m.
&quot;The year-round school concept for Mitchell, Scarlett and its feeder elementary schools was postponed after attracting criticism from the community...&quot; Burns Park Elementary is a feeder school to Scarlett. WIll they be part of the &quot;balanced calendar proposal?&quot; If so, please seek parental input. Tue, Mar 13, 2012 : 4:15 p.m.
&quot;Parents said at last week's sixth grade orientation, Principal Gerald Vazquez told incoming families the year round school proposal is off the table unless Superintendent Patricia Green decides to implement it district-wide.&quot; I hope, repeat, hope Superintendent Green does not do a late night maneuver on this. Year Round school is a tremendous change and much input need to be obtained from the community before any decision is made to go of not to go. I'm hoping that she understands the need to get broad input and not just input from a few who provides political cover for her proposals. Tue, Mar 13, 2012 : 3:59 p.m. This is perhaps heresy, but I actually like the &quot;balanced calendar&quot; approach and would support it for my kids (@chubabuba's link is a nice summary: <a href="http://www.nayre.org/calendar_comparison.htm)" rel='nofollow'>http://www.nayre.org/calendar_comparison.htm)</a>. I'd agree that how to phase something like that in would be the biggest challenge and I would not be supportive of trying it on just one school and it's feeder schools. It's a pretty all in approach and should be done district wide if at all. &quot;Balanced calendar&quot; or&quot; Mayan calendar?&quot; A "balanced calendar" when you choose what days the kids will show up for school vs. what few days the teachers aren't furloughed. "Mayan calendar" the days you choose to toss a few administrators down a set of stairs to appease the gods. 2012 time is short; start tossing! Tue, Mar 13, 2012 : 2:38 p.m.
Tue, Mar 13, 2012 : 1:30 p.m. I still feel that the children living in our city need the 10 weeks off in summer so that they can work in the fields and farms while forgetting everything they learned in the last school year. Plus, we adults who are set in our ways would find it difficult to adapt to a change in schedule. Let's not forget that high school students would be forced to learn how to balance school work with jobs. They might actually have to work on weekends and spend study hall time for studying. Our city swimming pools would be forced to open at 3pm for general swim rather than 1pm. Camps would be forced to raise their prices since they would need to hire year-round, professional staff to offer programming during all the breaks rather than relying on seasonal staff who are paid in smiles, food, lodging, and gas money. We don't need 10 weeks just like we do not need to be starting school after Labor Day weekend. Or so says Granholm which I wish she never did to keep money feeding into MI economy. Children are ready to go back to school the week before and so are the parents. One month is more then enough of time off for summer. I would like to see your data on the last paragraph though. I can't imagine that one at all. Tue, Mar 13, 2012 : 1:06 p.m.
Tue, Mar 13, 2012 : 12:17 p.m. Principal Gerald Vazquez told incoming families the year-round school proposal is off the table, unless Superintendent Patricia Green decides to implement it district-wide. Isn't it a little presumptuous to assume Superintendent Patricia Green CAN decides to implement it district-wide? There are lots of decisions made in this town WITHOUT listening to the residents BUT I don't think that horse will fly. Actually you can. If I remember an article out of this on line news place, they mentioned you can and go to another middle school. As for the professors Burns Park? I think that is pretty shallow don't you? Might want to call over priced Balias and see what they have to say. Tue, Mar 13, 2012 : 6 p.m.
Tue, Mar 13, 2012 : 2:32 p.m.
Actually, Burns Park, Pattengill, Angel, Allen and one more do feed into Tappan. So the social etiquette thing flies out the window. Watch how you phrase that one. Otherwise, the elementaries that feed into Scarlett will become part of that calendar unless parents opt out. if AAPS has its way? This will fly and will become part of the norm. There are a lot of parents out there that want this. It will be interesting to see this all pans out. Tue, Mar 13, 2012 : 1:25 p.m.
Let's be clear, this would never fly in those enclaves of privilege where board members, U-M professors, and school administrators live. However those same folks will gladly &quot;fix&quot; the under-performing schools, as long as it does not infringe on their personal vacation and holiday schedules. If there was any interest in improving Scarlett, it would begin by adjusting boundary lines to send the children of board members, U-M professors, and school administrators to the school. They are more interested in their experimental approaches with no guarantees than doing what is right for the community as a whole. This way they can keep their Burns Park/Tappan/Pioneer social track for themselves, and rationalize that they have tried to do the &quot;right thing&quot; for those poor &quot;Ypsilanti&quot; people (actually East Ann Arbor and Pittsfield). Dr. Green does not listen to residents of the Scarlett part of the district and never will. She clearly does not care what we think, or what the impact of their bold experiments might be on regular folks outside the education business. Unfortunately we will be saddled with her until her next retirement. Tue, Mar 13, 2012 : 12:01 p.m.
@ Danielle - I agree with other commenters asking for explanation earlier in the story about what a &quot;balanced calendar&quot; is and also, could you explain in the article what exactly is the rationale for the idea at Scarlett-Mitchell or the whole district? @Paula --thank you for adding some information earlier in the article, but the article repeats the p.r. term &quot;balanced calendar&quot; several times. Can you change that to &quot;year-round&quot; or a more accurate term. ? -- Do the rest of the of the buildings currently have &quot;imbalanced calendars?&quot; The district already has Skyline, which follows its own calendar with a trimester system and days off different than the other buildings. If the superintendent at a $300-k-plus salary is trying to improve quality in a district, I would expect her to present new ideas with a detailed rationale based on data from within the district and even better, from other districts of similar size that are performing at a higher level than our district. If the &quot;balanced calendar&quot; is so fantastic, let's pilot it in these areas: Angell-Tappan or Burns Park-Tappan or Wines-Forsythe.. I think this is unlikely because the district's well paid administrators try to not inflame the parent groups in those areas of town, hoping that those groups will stay happy and vote for millages or better, hoping that they donate to the educational million-reasons fund. Why is Mitchell-Scarlett being singled out for an experimental program that has no rationale publicized to date that is based on outcomes? Tue, Mar 13, 2012 : 11:33 p.m.
Tue, Mar 13, 2012 : 10:29 p.m. But, those 8-10 Burns Park to Scarlett kids have little siblings that would not be on a &quot;balanced calendar&quot; while at Burns Park. This would be a nightmare for families. I think the district needs to step up and provide the transportation for the 8-10 kids to remain at Tappan with the friends they have made in elementary. They bussed them for elementary, keep bussing them to Tappan. Tue, Mar 13, 2012 : 7:10 p.m.
Beth, yes Burns Park does split into Scarlett, the numbers are relatively low though. On any given year you are talking about 8-12 kids total. Tue, Mar 13, 2012 : 5:58 p.m.
@MSC - Does Burns Park really split between Tappan and Scarlett? Interesting - I had not known that! I don't believe that any of the Scarlett feeder schools or Scarlett itself are air-conditioned, so that will be a huge issue if a balanced calendar is ever adopted. Tue, Mar 13, 2012 : 4:30 p.m.
Burns Park is a feeder school to Scarlett. The students that are bussed from apartments east of Carpenter Rd. attend Scarlett. WIll Burns Park be a &quot;balanced calendar&quot; school? If so, you'll need to air condition that school. Tue, Mar 13, 2012 : 11:20 a.m. Unless the buildings in question have adequate air conditioning in all rooms, there is no way a year round schedule will work. Students and teachers should not be expected to swelter in classrooms during June, July and August. At present, there isn't one building in the district that can handle hot weather in classrooms with the exception of Skyline. Even with the current calendar, when it gets hot in May and June, the buildings are not properly air conditioned. Most school building facilities are older and have not been maintained or updated. Tue, Mar 13, 2012 : 10:34 a.m. It is not until the last paragraph of this story that there is any explanation of what a &quot;balanced calendar&quot; is, and even then it's not clearly a definition, just an off hand remark about &quot;the year round concept&quot;. Isn't the traditional scheme of a newspaper article that &quot;who what where and when&quot; get answered in the first two paragraphs, and the subsequent paragraphs are more details and less critical to the story? In the old days it was so the article could be trimmed to fit the page; now it's still pertinent as many readers will only scan the first few paragraphs. I had to read the article 3 times before I even noticed the seemingly explanatory phrase in the last paragraph. Tue, Mar 13, 2012 : 3:45 p.m. I agree with you mermaidswim. At first reading, I thought this was a conversation among district officials. If the interest is to inform the public, this should have been addressed upfront because it would have aided in a better understanding of the issue. I'm so tired of reading about school politics. I want to read bout the fine accomlishments of our students. Tue, Mar 13, 2012 : 12:05 p.m.
Mermaid, there is no news in Ann Arbor anymore. Tue, Mar 13, 2012 : 11:46 a.m.
We just added a mention of what it is earlier in the story.